Dr. Sidle is one of the leading septo-rhinoplasty and rhinoplasty surgeons at Northwestern Memorial Hospital in Chicago. He is Board Certified by the American Board of Facial Plastic and Reconstructive Surgery and the American Board of Otolaryngology-Head and Neck Surgery and has extensive surgical expertise in primary and revision rhinoplasty for the improvement of both appearance and breathing. Dr. Sidle also as extensive experience in Ethic Rhinoplasty. His experience, location, and double board certification make him an expert in Chicago Rhinoplasty. Rhinoplasty is often referred to as septorhinoplasty because rhinoplasty and septoplasty are often performed at the same time. Rhinoplasty for aesthetics and for breathing is considered one of the most difficult of all the surgeries since it requires the technical skills to repair the septum while ensuring the external shape of the nose is aesthetically pleasing. Dr. Sidle possesses special interest and expertise in septorhinoplasty, originating from his specialized training in Ear Nose and Throat Surgery and Facial Plastic Surgery. What can I expect during my rhinoplasty consultation? Dr. Sidle believes in educating, supporting and counseling his patients from before the procedure through the recovery process. During your rhinoplasty consultation, he will discuss in depth your individual needs and any concerns you have. The use of digital photography and a computer assisted imaging program may allow you to view realistic possible outcomes from rhinoplasty. What will happen during a septorhinoplasty procedure? During septorhinoplasty, incisions are placed just inside the nostril on its the lower edge and sometimes across the skin between the nostrils. The soft tissues of the nose are then carefully separated from the underlying cartilages and bone. Bone and cartilage are appropriately reoriented to give a balanced harmonious appearance to the nose and face while preserving or improving nasal breathing. What will recovery from rhinoplasty be like? The procedures usually last two to four hours, depending on the amount of work required. A light internal dressing may be applied and removed in 1 to 2 days and small splint is placed on the external nose for one week. 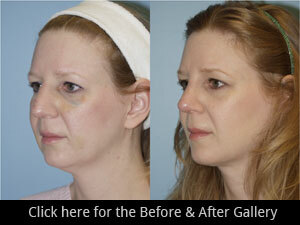 After rhinoplasty, some swelling and bruising of the nose and eyelids may occur, but typically subsides within a week. The associated discomfort is typically mild, lasts only a few days, and is easily controlled with medication. What are Dr. Sidle’s qualifications? Dr. Sidle is board certified in both Otolaryngology-Head and Neck Surgery and Facial Plastic and Reconstructive Surgery. He did his surgical residency training in Otolaryngology-Head and Neck Surgery at Northwestern University Medical School in Chicago. Dr. Sidle completed his specialty training with a fellowship in Facial Plastic Reconstructive Surgery at the University of California, San Francisco. In 2005, Dr. Sidle was appointed as Director of the Division of Facial Plastic and Reconstructive Surgery in the Department of Otolaryngology – Head and Neck Surgery at Northwestern University.